Fighter jets can be very beautiful aircraft, their grace and smooth lines often overshadowing their deadly nature. The McDonnell Douglas F-15 Eagle is definitely no exception to this rule, the fighter jet that has pretty much defined looks for fighter jets over the last 30 years or so. In the mid-1960s, the United States Air Force was already looking to build the next air superiority fighter to fly alongside its MD F-4 Phantom II and their rapidly-aging Convair F-102 and F-106 interceptors, slowly replacing all three. Based on the opinions of experienced fighter pilots fresh from combat sorties over Vietnam, a number of scientific research studies and whatever intelligence the spooks at the CIA were able to gather on foreign fighter designs, the USAF drew up a set of requirements ideal for their new jet. It had to be all-weather, highly agile giving it the edge in air-to-air combat, excellent range, fast (of course), capable of being used in an air-to-ground attack/strike role, and able to carry a sizable weapons payload. The above don’t seem too far out of the ordinary, especially when you think of what a fighter jet should be able to do, in modern terms. However, at the time, the USAF, in addition to a number of other air forces around the world, had a number of different aircraft flying different yet overlapping roles. Some functioned as interceptors, others as fighter/bombers, others as fighter/attack, etc. The USAF correctly surmised that they’d be able to save exponentially by having multirole air superiority fighters that could perform all of these tasks with ease instead of maintaining fleets of varying aircraft. 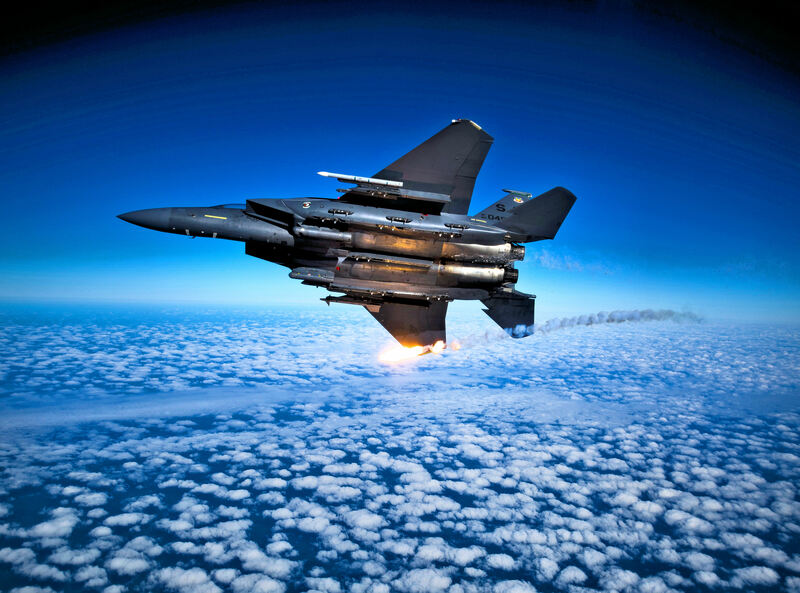 A USAF F-15E Strike Eagle aircraft from 335 FS releases flares during a training mission. United States Air Force photograph. Photograph by Staff Sgt. Michael B. Keller. So began the F-X program, initiated after the USAF received a number of proposals from different aircraft manufacturers around the United States incorporating answers to the requirements set forth by the brass in charge of procurement and acquisitions. They originally rejected a joint venture between the AF and Navy (the VFX program, which eventually resulted in the Grumman F-14 Tomcat being selected as the Navy’s next multirole/air superiority fighter), and brought it much more concentrated proposals from Fairchild Republic, North American Rockwell and McDonnell Douglas, all three of which were established and highly-successful defense contractors. MD eventually won out the competition a year later, its design being similar in nature to that of the F-14 albeit lacking the variable-geometry wings, rivaling the F-4 in size. MD’s design was further influenced by the revelation of the development of the MiG-25 on the other side of the Iron Curtain, a jet ascribed near-mythical specifications to it by the unaware western intelligence agencies. What the western spook organizations didn’t realize, was that MiG-25s were designed as high speed/high altitude interceptors and reconnaissance jets, not the air superiority strike aircraft that they figured they would be. Conversely, F-15s are designed to be all-round air superiority fighters. The funny thing is that once the West got wind of the Foxbats, they automatically assumed that it was going to be the next leap forward in military aviation. With significant funding going into the program, McDonnell Douglas souped up the F-15 to the point where they figured it’d at least have a fighting chance against the Foxbat. After a Soviet pilot defected with his jet and the West had the chance to analyze it, they came to the conclusion that they had grossly overestimated the MiG and the Eagle was vastly superior. The F-15 featured a brand-new radar designed to pick out low-flying opposing aircraft from the typical clutter caused by the environment on the ground (e.g. trees, changing terrain, etc. ), an internal cannon, the ability to carry virtually any air-to-air or air-to-ground munitions available in the USAF’s arsenal, onboard computers to ease the workload of the pilots who flew these birds. The Eagle is extremely aerodynamically-efficient thanks to the placement of its wings and the wide design of the fuselage. So efficient that in 1983, when an Israeli F-15 lost its right wing in a midair collision with an A-4 Skyhawk, its pilot was able to recover the aircraft and land it successfully. That particular Eagle was repaired and returned to service, scoring a kill in 1985, two years later. The F-15 first entered service with the USAF in 1974, the first combat Eagle delivered in 1976, two years later. The Eagle came into service too late to see action in Vietnam with the USAF, but saw extensive action with the Israeli Air Force. An IAF pilot was, in fact, credited with the F-15’s first ever kill in 1979. The IAF put their Eagles to good use, going on to blow a number of enemy aggressor aircraft out of the sky in the following two years, two of those aircraft the aforementioned MiG-25s, exported by the USSR to Syria. IAF Eagles were highly successful during that timeframe, racking up kills by the numbers and hitting ground targets with high accuracy and extreme effectiveness. Saudi pilots also saw limited success with their F-15s, shooting down a few Iranian and Iraqi aircraft between the mid-80s and the Gulf War. The USAF showcased the success of their Eagles with 34 confirmed kills against ex-Soviet aircraft including the MiG-29, the jet the Soviets built to outfly the Eagle, during the Gulf War. Throughout its history, it’s been able to maintain a perfect record, having never lost a single airframe due to air-to-air combat. Overall, 104 kills in total to zero losses. The wildly-successful F-15 was adapted and given a few new upgrades by McDonnell Douglas in the mid-80s, resulting in the F-15E Strike Eagle, a much more powerful multirole fighter with better radar and targeting systems, extended range and a redesigned cockpit with pilot/WSO-integration systems allowing for increased overall performance and electronic warfare capabilities. A further derivative of the F-15E, introduced in 2009, is the F-15SE, aka Silent Eagle. The SE incorporates stealth technology, internal weapons bays, fuel efficient engines and a lighter airframe with increased weapons payload. The Eagle has served more than 39 illustrious years in various air forces of the world, notably that of the US, South Korea, Japan, Israel and Saudi Arabia, unmatched and surpassed only by the 5th generation of fighters (e.g. The F-22). With consistent upgrades and replacement by newer designs outputted by Boeing (the company that bought out McDonnell Douglas in the 1990s), the Eagle is sure to be a mainstay of military aviation, even decades from now. Just been brought to my attention that the header picture used above is mine. No request for usage made, no credit given. Common courtesy would have been appreciated, can I ask where you lifted the picture from? A.Net or Airfighters? Hey Tom, this article was published four years ago prior to TACAIRNET’s existence, and on a predecessor site. I can’t really say for certain where we got the image from, as we had a larger team back then, and the handler responsible for imagery and video selection (including the F-15 picture you say is yours) hasn’t worked with us in just over two and a half years, but I believe we might have gotten the image from Wikimedia Commons, as it generally been our policy to use Public Domain imagery unless the image pertains to a specific incident or event, and we can’t find any released shots of it. In situations like those, we either contact the photographer directly or refrain from publishing any article until suitable imagery can be found. If you can send me a similar shot or proof that you own the picture in question, I’ll immediately see to it that the caption is amended to give you full credit, or the image is outright removed, on your decision. You can reach me at idcosta@tacairnet.com. Apologies in advance for the inconvenience.